Would you like to become a stronger swimmer? Would you like to develop better rhythm and timing with your stroke? If so, here is the drill for you! Tarzan drill, aka water polo drill, is a great drill to practice regularly. If you have never done Tarzan drill or it has been awhile since you’ve performed it, I recommend starting off with a short distance. Try a set of 4x25’s as 1/2 length Tarzan drill followed by 1/2 length swim with a high turnover resting 20 seconds after each 25. If that feels too easy try 4x50’s 25 Tarzan drill/25 swim. - Swim with your head out of the water and your chin at the surface of the water. - Keep your head as straight as possible only turning it to the left or right to get a breath of air. - Pick up your turnover and swim with a strong cadence (no gliding). Adding Tarzan drill to your workouts will improve your swim strength and cadence of your freestyle! Have you ever started out too fast in practice or a race and had your stroke fall apart half way through? This ailment affects many swimmers and is commonly referred to as PAC (Pace Awareness Challenged). It’s not really, I just made that up! Not sure what your pace is or where to begin? Try taking a CSS Test explained here. 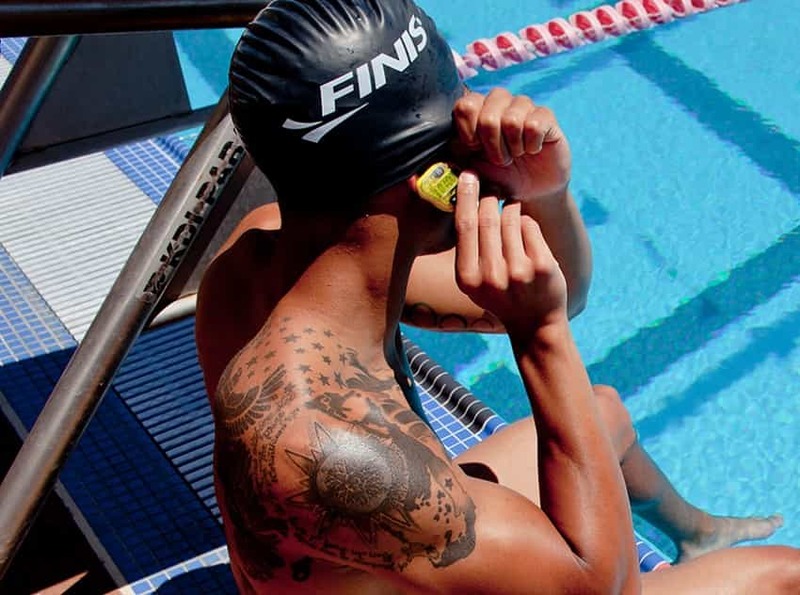 Check out the FINIS Tempo Trainer. Readers of the Modern Swim Blog receive 25% off their entire order with the code OGREN25 at checkout. I’ve ponder this quote and how it could relate to swimming. Is your swimming successful? Is it a failure? (I hope no one answered yes to this question because we are all works in progress). Maybe you are somewhere in between. Below are a few simple disciplines you can practice everyday. These are the foundations of great swim technique and are the simplest things you can do to ensure your swim success! Brighton Swim Academy, plus a podcast! Greetings all! It’s been a little while since my last blog post and I am happy to reconnect with you. I have been hard at work constructing my very own swim facility here in South Carolina. Recently I was interviewed on the Healthy Charleston podcast. Have a listen here! 31:45 Spit fire questions: Definition of health/What am I best at?/ #1 Thing to maintain your health/ The Price is Right! A simple yet effective exercise for your overall health is hanging. I started hanging about a year ago and the results have been incredible. Hanging has improved my shoulder mobility, strength, and posture; three imperative things for swimmers. Hanging also helps develop wrist and forearm strength aka grip strength. Why is it important to develop wrist and forearm strength? Think about it, if you are going to do any exercise that requires the use of your hands, developing grip strength is a great place to start. Another benefit of hanging is that it decompresses the spine. If you are seated for long periods of time, run, walk, cross train -your spine can become compressed. Hanging will help undo pressure built up in your spine. 1. Passive hang - grip bar and relax the entire body down. Shoulders into ears, keep elbows straight and let gravity do the rest. 2. Active hang - start off in a passive hang and simply lower your shoulders down keeping the elbows straight. Active hangs can be done as reps or for time. A great dry land exercise for swimmers are pull-ups yet they can be challenging if it’s been a while since you last did them. I’ll often recommend passive and active hangs to build a base before moving onto pull-ups. No pull up bar, no problem. Visit Amazon and pick up one of these for your home and office. I received one about 10 years ago as a Christmas gift (thanks JG) and have since gifted a few myself. Unfortunately, the code Ogren25 won’t work on Amazon, but it’s still good for all your swimming needs at the Finis store. Until next time, hang in there. Congratulations, you just swam swim practice. You found time as a busy adult for your health and well-being. Bravo! Now that your workout is done, it is time to start thinking about how to replenish your body and get it ready for your next workout. Hydration is so vital to your overall well-being. When I was a wee lad we didn’t bring water bottles to swim practice. No joke. Thankfully today when I walk into age group swim practices water bottles are omnipresent. Take a cue from the kids and get serious about staying hydrated. One of the best recovery tricks is to hydrate pre, during, and post workouts. Now onto food. Carbohydrates and proteins are needed to return the body to its pre-exercise state and timing is paramount. Aim to eat a snack or exercise drink that includes protein and carbohydrates within 15 minutes of finishing practice. Waiting to get home or to the office before refueling with a quick snack can lead to a ravenous appetite and overeating. Carry snacks in your swim bag or glove box to make sure you don’t miss this window. Stay beautiful mermaids and mermen! Open Water training at the pool! In my last blog, I spoke about Swim Smooth’s three keys to swim development, which are Technique, Training, and Open Water Skills. How do you train for the open water in the winter? Easy. Here are 5 skills to work on (in the pool) to ensure you’re ready for open water season. Breathing: make sure you are practicing breathing onboth sides (bilateral breathing). Your favorite side to breathe to may not be an option come race day due to waves, sun glare, or navigation benefits. Learning how to bilateral breathe also helps you swim straight! Sighting: grab a pair of fins and sight every 6 strokes. I have found that sighting is easiest when combined with breathing to your favorite side. Drafting: swim with a buddy and stay right on their toes focusing on swimming in their bubbles. Swim 200 yards switching the lead position after each 50 so each swimmer can feel the difference of drafting as opposed to being the leader. Tarzan swimming/water polo drill: swim with your head out of the water for 10 strokes then finish the length with your head in the water. Try to keep your head straight when performing this drill. Side by side swim: arrange 2 or 3 swimmers across in a lane and perform 8x25’s fast. This will get you use to swimming in close quarters, mimicking a race start. Give these ideas a try and you’ll be ready for the open water this season! In my last blog, I wrote about excessive head movement and how it can negatively affect your swimming. Since then I received quite a few inquiries about what is ideal head position and where a swimmers eyes should be focused. Should they be looking completely forward to the other end of the pool? Or straight down at the black line? Or somewhere in between? In 1988, while swimming for St. John’s University we were taught to look straight ahead, eyes forward with the water line at our forehead. This position is not the best for most swimmers and should not be adopted unless you have been analyzed and your body line can afford this head position. Here are a couple of pictures from my Charleston, SC Clinic last month. Notice the difference between the eye/head position and body line with regards to the surface of the water. You can clearly see how looking forward negatively impacts her body position, sinking her hips and legs in image 1. A low head position with eyes looking straight down toward the bottom of the pool is often advised by swim coaches as a way to help lift the legs. At Swim Smooth we treat this as a last resort to improve body position. Looking straight down (image 3) or down and back (image 4) lessens the swimmers' peripheral vision and proprioception of the lead arm, making it difficult to learn proper hand entry. It also hinders good spinal alignment. Furthermore, swimmers who normally have good body position may feel unbalanced when looking straight down, as it could lift their legs too high in the water. Bottom Line: You have a variety of head positions to choose from and unfortunately it’s not one size fits all. Head position is truly individual, but the one that works for most swimmers is in image 2 (eyes diagonally downward). And by all means, keep your eyes open when you swim! Swim Straight! When you think about it, everyone swims relatively straight in the pool. Why would it be any different in the open water, you say? Well, the pool has a thick black line on the bottom, lane lines, and angry lane mates working synergistically to keep us on the straight and narrow. To see how straight you really swim give this a try. At your next open water workout (within the confines of safety and your swim companions alert to what you are doing) try taking 25 strokes with your eyes closed. Swim straight? If you did not, have no fear most of us don’t. Here are a few tips and drills to getting you back on course, swimming straight. Typically, the most common cause of swimming off course is having a crossover in your stroke. If one arm is crossing over your centerline you will gradually be pulled in the direction of that arm. Work on your posture and focus on placing your hand in front of your shoulder upon entry and you will begin to swim straighter. Use the Kick on Your Side drill to help keep you swimming in a straight line. Sighting is a great skill to begin working on in the pool. When sighting, aim to lift just your eyes out of the water to see where you are going. Take a breath of air to the right or left as you would normally do when swimming instead of breathing forward. By lifting just your eyes out of the water you will maintain good body position which will reduce drag and keep you swimming fast. Practice drafting. It has been shown that swimmers who draft can save anywhere from 11%-38% of their energy expenditure. There are two types of drafting; in-line which is one swimmer stacked behind the other and arrowhead which looks like geese flying south for the winter. Drafting is easily practiced in the pool. Try this handy in-line drafting set: If you are swimming with two other people, swim directly behind each other and aim to stay in their bubbles. Try to swim as close as you can to the person in front of you without touching their toes. After each 100 switch positions so you can all experience the draft. WARNING: Please don’t wait for the week before your race to practice your open water skills! Start now, my friends. If you are an open water swimmer or triathlete it is imperative to practice open water skills and make them a regular part of your training. Training in the open water is great practice for open water racing, but if you are limited to just pool training, try these five drills to improve your open water skills. Bilateral breathing is a skill that needs to be developed for your open water swimming. 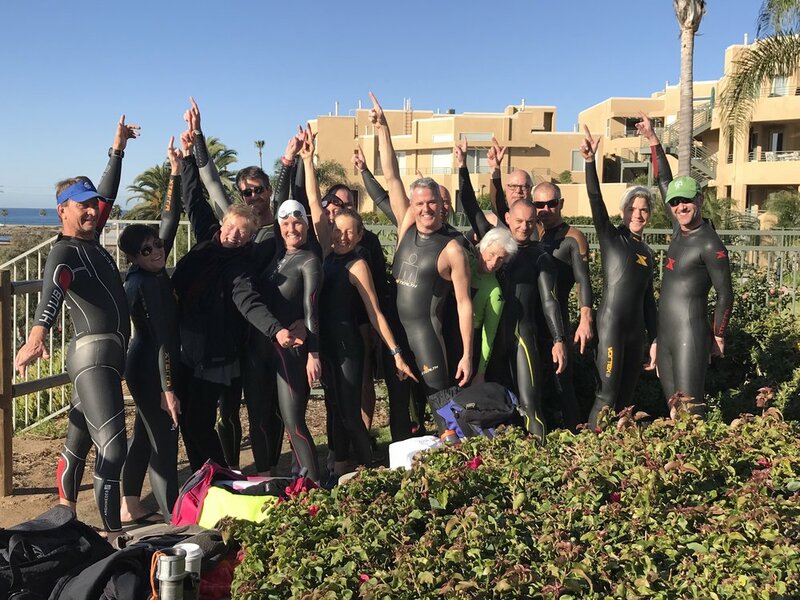 The benefits of Bilateral Breathing in the open water include swimming straighter, better visibility of competitors and drafting opportunities, and the option of breathing away from sun glare or chop. Even if you feel you can swim faster breathing unilaterally chances are you will swim straighter in the open water breathing bilaterally, thus saving you time due to less distance traveled. Take the Swim Smooth 2-week bilateral challenge to get over the bilateral hump. For two weeks swim as much of your workouts breathing bilaterally as you can. We have found that after two weeks things begin to get easier and bilateral breathing becomes much more manageable. If you struggle with bilateral breathing have a look at The Most Important Swim Blog of 2017. Tarzan swimming aka water polo drill is simply swimming with your head out of the water. This drill is helpful because it is an exaggerated sighting technique. In this drill your whole head comes out of the water (compared with just the eyes when sighting). If on race day you are confronted with choppy conditions you might need to raise more than your eyes out of the water to sight. By placing similar demands on yourself in the pool you will build your stamina for those tougher days in the open water. If you struggle with this drill try alternating 10 yards drill/10 yards freestyle or, try using fins or a pull buoy. In next week’s blog I will talk about sighting, drafting and crossover.